Canine degenerative myelopathy (DM) is a fatal, slowly progressing neuro degenerative disease with a late onset (age 8 years or older). The initial clinical sign is characterised by spastic and general proprioceptive ataxia of the hind limbs. As the disease progresses, the frequently observed asymmetric weakness ascends to affect the thoracic limbs, resulting in paraplegia. Hyporeflexia of the myotactic and withdrawal reflexes occur. Initially, DM has been recognised as a spontaneously occurring, adult-onset spinal cord disorder in German Shepherds. Nowadays, DM has been diagnosed in several other dog breeds, including Pembroke Welsh Corgi, Boxer, Rhodesian Ridgeback and Chesapeake Bay Retriever. A mutation in exon 2 of SOD1 gene was identified as major risk factor for developing DM in many breeds so far. In the Bernese Mountain Dog breed, an additional mutation in exon 1 of SOD1 gene was characterized as being also a risk factor for DM. 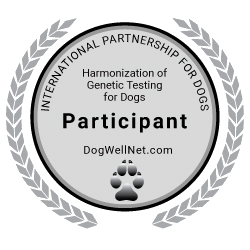 We offer genetic testing for both mutations in Bernese Mountain Dogs as combi or single tests.